Best known for the Primetime Emmy Awards, the Television Academy has used a very literal depiction of the Emmy statuette — recognized the world over as a symbol of television excellence — as the key component of its logo for more than 60 years. While elegant and emblematic, Emmy speaks to a very specific annual recognition of television excellence. But the Academy and its Foundation present a full scope of year-round programs, events and initiatives benefiting members, students, the industry and the public. And with the Academy's emphasis on the industry's rapid evolution, it has set a priority of bringing divergent and provocative voices together to address the future of the medium. So it was time for the organization's logo and marks to reflect this evolution, and truly represent what the Television Academy stands for and its role in the community. The renowned brand strategy and design firm, Siegel+Gale, came on board to work with Academy leadership and staff on a thorough brand assessment and review, and to create a fresh identity system. First, the decision was made to simplify the organization's name to the comprehensive and colloquial "Television Academy." 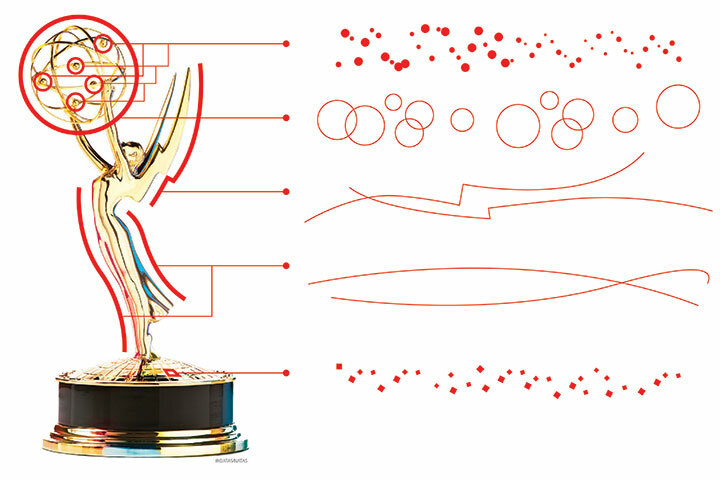 Second, the Emmy statuette would live apart from the logo, refined and strengthened as a graphic symbol. Ultimately, several elements were developed as the basis of the Academy's identity — a new logo, a bold Emmy statuette symbol, a new typography, a specific color palette, an attribution line, and a graphic motif that could be used for added design energy and texture. The master logo features the Television Academy name, stacked and aligned and displaying a new typeface, Foundry Sterling. Certain letters (T, A, V and Y) have been modified to carry both sharp and rounded edges to make the logo typeface unique to the Academy. A vertical bar appears to the right, representing a transformative portal and the many possibilities offered by Academy programs that encourage, connect and inspire talent, and engage television audiences. The Foundation logo builds on this basic configuration, adding "Foundation" underneath the words "Television Academy." The graphical treatment of Emmy is stronger and more athletic, but loses none of her grace and inspiration. She teams with the Academy logo during Emmy season and when there is a need to establish a strong connection with the Academy or the Foundation. The primary color for both the logo and Emmy is a gradient gold, and a vibrant, complementary selection of secondary colors was chosen to use in materials designed for the wide variety of Academy programs and events. The attribution line "The people who bring you the Emmys" is viewed as a reinforcement to be used outside of Emmy season for public audiences who know the awards telecast, but may not be familiar with the other programs and resources available to them. Perhaps most interesting is the graphic motif element – inspired by the timeless Emmy statuette, and flowing from the right side of the Television Academy portal line. This artful collection of circle and diamond shapes, indented and wavy lines, is derived from the forms of the physical Emmy Award statuette and its base, and are used with bands of transparent, gradient color. The result is a visual identity system that is simple, bold and sophisticated. It's a dynamic representation of the Academy and its focus on advancing the television industry, while supporting and celebrating the many talents who are pushing the boundaries of television.